We are associated with a renowned Chinese manufacturer for Amorphous Graphite, available in briquette and ball-shape. We have with us a comprehensive range of Amorphous Graphite that is that is availed by our esteemed clients. We have sound business relationships with renowned manufacturers, custom agents etc. which enable us to provide the best Amorphous Graphite and value added services. These are produced as per the set industry standards and are available at competitive prices. We offer low ash and low volatile content natural graphite from our mines and plant. 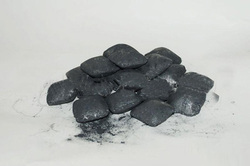 We can provide all kinds of natural graphite, amorphous graphite, high purified graphite, high carbon graphite, micronized graphite, expandable graphite and synthetic graphite.